Data mining process is the discovery through large data sets of patterns, relationships and insights that guide enterprises measuring and managing where they are and predicting where they will be in the future. Large amount of data and databases can come from various data sources and may be stored in different data warehousess. And, data mining techniques such as machine learning, artificial intelligence (AI) and predictive modeling can be involved. The data mining process requires commitment. But experts agree, across all industries, the data mining process is the same. And should follow a prescribed path. Here are the 6 essential steps of the data mining process. First, it is required to understand business objectives clearly and find out what are the business’s needs. Next, assess the current situation by finding the resources, assumptions, constraints and other important factors which should be considered. Then, from the business objectives and current situations, create data mining goals to achieve the business objectives within the current situation. Finally, a good data mining plan has to be established to achieve both business and data mining goals. The plan should be as detailed as possible. The data understanding phase starts with initial data collection, which is collected from available data sources, to help get familiar with the data. Some important activities must be performed including data load and data integration in order to make the data collection successfully. Next, the “gross” or “surface” properties of acquired data need to be examined carefully and reported. Then, the data needs to be explored by tackling the data mining questions, which can be addressed using querying, reporting, and visualization. The data preparation typically consumes about 90% of the time of the project. The outcome of the data preparation phase is the final data set. Once available data sources are identified, they need to be selected, cleaned, constructed and formatted into the desired form. The data exploration task at a greater depth may be carried during this phase to notice the patterns based on business understanding. First, modeling techniques have to be selected to be used for the prepared data set. Next, the test scenario must be generated to validate the quality and validity of the model. Then, one or more models are created on the prepared data set. Finally, models need to be assessed carefully involving stakeholders to make sure that created models are met business initiatives. In the evaluation phase, the model results must be evaluated in the context of business objectives in the first phase. In this phase, new business requirements may be raised due to the new patterns that have been discovered in the model results or from other factors. Gaining business understanding is an iterative process in data mining. The go or no-go decision must be made in this step to move to the deployment phase. The knowledge or information, which is gained through data mining process, needs to be presented in such a way that stakeholders can use it when they want it. Based on the business requirements, the deployment phase could be as simple as creating a report or as complex as a repeatable data mining process across the organization. In the deployment phase, the plans for deployment, maintenance, and monitoring have to be created for implementation and also future supports. From the project point of view, the final report of the project needs to summary the project experiences and review the project to see what need to improved created learned lessons. 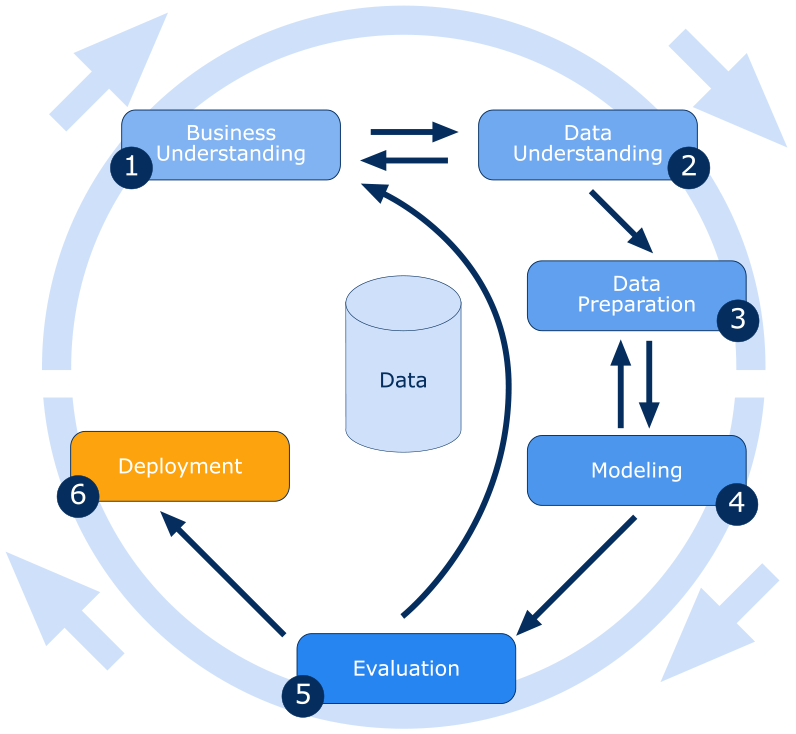 These 6 steps describe the Cross-industry standard process for data mining, known as CRISP-DM. It is an open standard process model that describes common approaches used by data mining experts. It is the most widely-used analytics model. Do these 6 steps help you understand the data mining process? What is your organization’s readiness for date mining? Data mining is: 1) The practice of examining large databases to generate new information and 2) the process of analyzing data from different perspectives to make it insightful and useful. Data mining is used by companies to increase revenue, decrease costs, identify customers, provide better customer service, listen to what others are saying and do competitive intelligence. And that’s just some of the ways. Here’s are 20 companies that do data mining and prove it makes their business better. AMAZON: With $5 off, for those who use the Amazon Price Check Mobile App – to scan the products in store, take a picture of the product or perform a text search to find the lowest prices, the app also prompts the customers to submit the in-store price. Amazon is collecting intelligence and valuable pricing information from its competitors. ARBY’S: The fast food company uses data mining to help them determine the best targets for their advertisements. They can see which advertisements are most effective, while seeing the channels that are most receptive to each ad pitch. This allows them to ensure every advertisement utilizes the appropriate channel to increase the number of leads from their marketing. CAPITAL ONE: Data mining and big data management to help them ensure the success of all customer offerings. By analyzing the demographic data and spending habits of customers, they’re able to determine the most optimal times to present various offers to clients, thus increasing the conversion rates of their offers and gaining more leads from their marketing budget. DELTA: Large airlines like Delta, monitors tweets to find out how their customers feel about delays, upgrades and in-flight entertainment. When a customer tweets negatively about his lost baggage, the airline forwards to their support team. The support team sends a representative to the passengers destination presenting him a free first class upgrade ticket on his return along with the information about the tracked baggage promising to deliver it as soon as he or she steps out of the plane. DUETTO: Known online for their “hotel optimization,” Duetto makes it easier for companies to personalize data to individuals searching online for hotels. Duetto makes it easy for hotels to personalize their prices by taking data such as how much you typically spend at the bar or casino to incentivize you with a lower price for your room. Therefore the hotel can give you a better price, knowing you’ll spend money on other services. The hotel can give you a better price, knowing you’ll spend money on other services. EXPRESS SCRIPTS: Which processes pharmaceutical claims, realized that those who most need to take their medications were also those most likely to forget to take their medications. So they created a new product: Beeping medicine caps and automated phone calls reminding patients it’s time to take the next dose. FREE PEOPLE: The more bohemian segment of Urban Outfitters, uses millions of customer records (reviewed by an in house analytics team) to shape the next season’s offerings. Information like what sold, what didn’t, what was returned and more fuels the brand’s product recommendations, the look of its website and what kinds of promotions customers see to improve Free People’s bottom line. GOOGLE AND CENTER FOR DISEASE CONTROL (CDC): Google proposed a different approach. Using historical data from the CDC, Google compared search term queries against geographical areas that were known to have had flu outbreaks. Google found spikes in certain search terms where flu outbreaks occurred and identified forty-five terms that were strongly correlated with the outbreak of flu. Google then started tracking the use of those terms and is now able to accurately predict when a flu outbreak is occurring in real time. Using this data, the CDC can act immediately. KREDITECH: European company, uses more than 8,000 sources including social media, to create a unique credit score for consumers, which is then sells to banks and other lenders. And they have discovered some surprising correlations between social media behaviors and financial stability. For example, if your Facebook friends use all capital letters, your score is docked. MACY’S: Through sentiment analysis of big data, Macy’s finds out that people who are sharing tweets about “Jackets” are also making use of the terms “Michael Kors” and “Louis Vuitton” frequently. This information helps the retailer to identify what brands of jackets should be offered discounts in their future advertising campaigns to attract customers. MCDONALD’S: With more than 34K local restaurants serving 69 million customers across 118 countries , 62 million daily customer traffic, selling 75 burgers every second, $27 billion annual revenue- McDonald’s is using big data analytics to gain lot more insight to improve operations at its various stores and enhance customer experience. McDonald’s analytics system analyse data about various factors such as wait times, information on the menu, the size of the orders, ordering patterns of the customers. NETFLIX: To create data models and find what makes show or movie popular among consumers, according to the insights they gained from their data, House of Cards was the ultimate entertainment experience. They went all out, winning a bidding war with other companies over the rights and immediately scheduled two seasons of content before showing a thing. It was a huge success, and the best part is they almost knew it would be. NORDSTROM: With 225 retail outlets, Nordstrom generates petabytes of data from its 4.5 million Pinterest followers, 300,000 Twitter followers and 2 million likes on Facebook. Their analytics system monitors customer behaviour by tracking – How many people enter the store, which section they walk in, how long they stay at the store and for how long they shop in a particular section. This helps Nordstrom decide what products should be promoted to which customers when and through what advertising channel. PANDORA: With 72 million users and the data for approximately 200 million users’ listening habits, Pandora is a name to reckon with in the music industry for providing music recommendations that people really love. Apart from the data like gender, age, zip code that users provide at sign up, Pandora tracks all the songs that a particular user likes and dislikes, from which location they listen, from which devices they listen and more – to provide customers with curated music catalogue based on interests and demographics. PREDPOL: The Los Angeles and Santa Cruz police departments, a team of educators and a company called PredPol have taken an algorithm used to predict earthquakes, tweaked it and started feeding it crime data. The software can predict where crimes are likely to occur down to 500 square feet. In LA, there’s been a 33% reduction in burglaries and 21% reduction in violent crimes in areas where the software is being used. STARBUCKS: As the leading coffeehouse company in the world, Starbucks manages to open new stores in very close proximity with their other stores, while still guaranteeing a high success rate. Normally, when expanding a company, it’s needlessly risky to open a new location just a block from another location. T-MOBILE: Data mining helps reduce customer turnover rate. By analyzing big data, T-Mobile can determine the core causes for turnover, allowing them to implement effective solutions that will keep more clients on board. As a telecom company, they accrue boundless quantities of data every year, and without big data management, the ability to analyze the data would be greatly inhibited. THOMSON REUTERS: Financial experts can gain competitive advantage by analysing the twitter sentiment data by tracking specific tweets from various companies and people. This helps financial professionals get an overview on the number of positive and negative sentiments related to any given company. Sentiment analysis along with other advanced big data analytics solution helps the financial professionals spot the financial market and any events impacting the company as they happen. 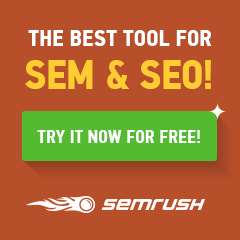 WALMART: The mega-retailer’s latest search engine for Walmart.com includes semantic data. Polaris, a platform that was designed in-house, relies on text analysis, machine learning and even synonym mining to produce relevant search results. Wal-Mart says adding semantic search has improved online shoppers completing a purchase by 10% to 15%. “In Wal-Mart terms, that is billions of dollars,” Laney said. Do these companies prove how data mining could make your business better? Could your company benefit from data mining? Although business leaders trust data to lead to insights on the effective management of their companies, many have no strategy on how to use data. Big data is an evolving term that describes any voluminous amount of structured, semi-structured and unstructured data that has the potential to be mined for information. To inspire you, since more and more data is available, here are 25 examples of companies doing something with Big Data. ATLANTA FALCONS: Use GPS technology to assess player movements during practices, which helps the coaches create more efficient plays. BANK OF AMERICA: “BankAmeriDeals” provides cash-back offers to credit and debit-card customers based upon analyses of their prior purchases. BASIS: Is a wrist-based health tracker and online personal dashboard that helps users incorporate small, progressive health changes over time—that ultimately add up to major results. BRITISH AIRWAYS: “Know Me” program combines already existing loyalty information with the data collected from customers based on their online behavior. With the blending of these two sources of information, British Airways is able to make more targeted offers while responding to service lapses in ways to create a more positive experience for the flyer. CAESARS ENTERTAINMENT: Combines patrons’ gambling outcomes with their rewards program information to offer enticing perks to those who are losing at the tables. CATAPULT: uncover vitally important information like whether an athlete is developing an injury, or whether certain workouts are overly stressful. That helps teams keep their players safe and game-ready. Sales grew 64% last year and Catapult now works with nearly half of NFL teams, a third of NBA teams, and 30 major college programs. COMMONBOND: Is a student lending platform that connects students and graduates to alumni investors and accomplished professionals. As a result, students are able to access lower, fixed-rate financing—and save thousands of dollars on their repayments. DUETTO: makes it easier for companies to personalize data to individuals searching online for hotels. Prices by hotels can be personalized by taking data such as how much you typically spend at the bar or casino to incentivize you with a lower price for your room. The hotel can give you a better price, knowing you’ll spend money on other services. EBAY: “the Feed” is a new homepage that allows customers to follow entire categories of items no matter how obscure. This makes it easier for customers to stay on top of the latest items they have a particular interest, especially if they are collectors. GE: monitors the performance of its jet engines to flag maintenance needs (such as blade wear), thus reducing flight cancellations for customers. GOOGLE: Working with the U.S. Centers for Disease Control, tracks when users are inputting search terms related to flu topics, to help predict which regions may experience outbreaks. HOMER: Handcrafted by top literacy experts, helps children learn to read. It has a complete phonics program, a library of beautifully illustrated stories, hundreds of science field trips, and exciting art and recording tools—combining the best early learning techniques into an engaging app that connects learning to read with learning to understand the world. LENDUP: a banking startup, evaluates whether to approve loan applicants according to how a user interacts with its site. NETFLIX: having drawn in millions of users with its high-quality original programming, is now using its trove of data and analytics about international viewing habits to create and buy programming that it knows will be embraced by large, ready-made audiences. NORFOLK SOUTHERN: Deploys customized software to monitor rail traffic and reduce congestion, enabling trains to operate at higher speeds. The company forecasts $200 million in savings by making trains run just 1 mph faster. PALANTIR TECHNOLOGIES: Uses big data to solve security problems ranging from fraud to terrorism. Their systems were developed with funding from the CIA and are widely used by the US Government and their security agencies. QSTREAM: allows sales reps to engage in fun, scenario-based challenges—complete with leaderboards and scoring—and produces sophisticated, real-time analytics. With this information, companies gain important insights into their existing knowledge gaps and are given the tools to create dynamic sales forces. RENTHOP: Is an apartment search platform simplifies real estate decisions, allowing users to look at curated apartment listings from trustworthy sources and determine which apartments are worth investigating—then schedule appointments with reputable brokers and property managers. SEARS: has consolidated data relating to customers, products, sales and campaigns to reduce the time needed to launch major marketing campaigns from eight weeks to one. SUMALL: Is a tool that draws in more than 60 different streams of data, including Google Ads, Fitbit, and Zendesk. And the company keeps adding more. UNITED HEALTHCARE: analyzes text converted from call center conversations to determine customer satisfaction levels via language-processing software. UBER: Is cutting the number of cars on the roads of London by a third through UberPool that cater to users who are interested in lowering their carbon footprint and fuel costs. Uber’s business is built on big data, with user data on both drivers and passengers fed into algorithms to find suitable and cost-effective matches, and set fare rates. UPS: monitors speed, direction and other drive performance metrics to design better routes through telematics sensors in more than 46,000 vehicles. VIROOL: is a powerful video service, allowing clients to target desired audiences on its global network of more than 100 million viewers. With affordable campaigns starting as low as $10 per day, Virool gives anyone the ability to distribute YouTube video content through a series of online publishers and offers clients full transparency with accurate and detailed analytics. These are businesses and brands that are both data-driven or dedicated to data. 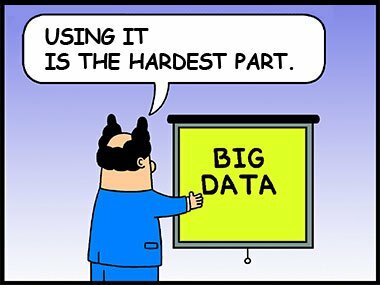 Are they good example of companies doing something with Big Data to you? Does your organization need help learning to work with data?